Screen door replacement is something you may be faced with if your screen door has just lost its last battle with the family dog. Or perhaps the door is just plain worn out. But go to your local building center and you are likely to find out that new sliding screen doors are something no one seems to want to bother helping you with. Dont you know you are supposed to buy a whole new patio door every time your screen door breaks ! Well not really, It's just that your sliding screen door replacement has to be made exactly to fit your patio door frame. There is no standard height or width. Just a lot of similar heights and widths. You might find one of those so-called adjustable doors, that are supposed to fit a range of different heights of patio doors, but the truth is those things are not built very well at all. .
What makes a good custom screen door ? custom screen doors come in two main frame types. Rollformed aluminum and Extruded aluminum. Rollformed screen door replacements are the cheaper type. Most builders use these to keep costs down. They are made from thin aluminum which is rolled into the shape of a screen door . Unfortunately once they start to get worn the corners get loose, come out of square and the frame is so thin it gets get bent in half. Usually in that order. You want a door that will last longer and be more durable. An extruded aluminum screen door replacement is a much better choice if you want something that's going to last. Extruded aluminum screen doors are made of thicker material than rollformed doors and have frames with strengthening ribs to prevent them from bending easily when Fido crashes into it. As well, look for a door that has ball bearing rollers each with springs and adjustment screws. Most screen doors use nylon rollers but these tend to get brittle with age and exposure to weather. It's a real pain when you spend good money fixing your screen only to have the rollers break apart when you are getting the door back in. Steel rollers will put up with more abuse. They also roll a lot better. Extruded aluminum doors are not indestructible but they do last for years with normal use and care. My own "knocked down" custom screen door replacement kits come in a form that you can put together yourself. Just like the picture above shows, complete with screen door frame, steel ball bearing rollers, latch and hardware, handles, corners, spline, bugstrip and screen cloth. Everything you need. To get a price for one, just fill in the quotation form at the bottom of this page. Fill in the dimensions of your old door, or if you dont have an old one, take your best guess, the form will send you a reply with a guide to get the measurement just right. Is it hard to measure and build my own door ? Measuring is not a difficult task at all. Certainly no worse than assembling furniture with an allen key from that famous swedish store. The measuring just involves making sure what kind of patio door you have and checking your measures 2 or 3 times to be sure. Measure twice cut once as they say. To make measuring easier I have set up a screen door kit measuring page to show you what you need to do. Not sure if want to do-it-yourself ? Just get your local handyperson to do it for you. 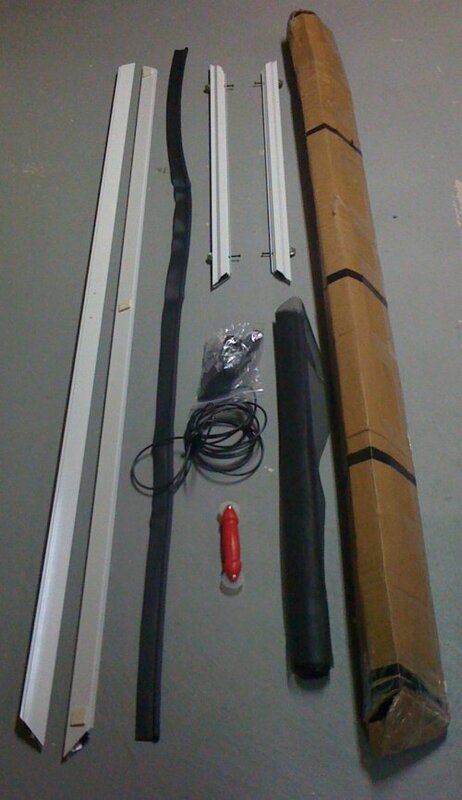 Any general handyperson will be able to put one of these door kits together in a snap. Or even take it to your local glass shop and let them assemble it. No big deal. Wondering if the screen door kit will match the doors and windows you already have ? Try the aluminum screen door kit colors page to get an idea if it will match. need screen door replacement ? My basic screen door kit works fine for sliding patio doors but many French doors are in need of screens too. French doors often need tracks as well. Click the link for my french door screens kit. Some patio doors are very wide and use double sliding screen doors. I have set up the double screen doors page to talk about the special issues to get two screen doors to meet in the middle. RV's, trailer's and mobile homes quite often use exactly the same sliding patio components as regular homes. The doors are just a little shorter and often not as wide as the door you find in a regular house. The same measuring techniques still apply. This page on RV screens should help with more specific information. My regular kit will fit many types of Recreational vehicles, trailers and even houseboats. All you have to do is measure the height and width correctly. It seems like the previous tenants always take the door with them. I have even made sliding screen kits for million dollar condos because the patio doors are so high end that they did not not have them! My regular kit will fit in these applications as well. The measurement techniques are the same. Just be careful you dont assume that all doors in a hi rise condo are the same size, they can vary in height from floor to floor and there may be several different widths in use. More information can be found here in my condos kits page. It's just a matter of getting the height and width measured correctly and getting the right color. Not sure about your application ?, just email me some pictures, you can find my email address on the home page of fixingscreens. Even better, I have Canadian made kits. These are actually heavier duty versions of the US model using thicker extruded aluminum and because of that they do cost more than the US model. They are made in Toronto, Ontario and shipped all over Canada. I am a property manager, do you supply kits for multi-unit buildings ? Or if you just need a source for replacing them as required its not a problem. Need a quote for a new kit ? Just dive right in and fill in the form below, the form will send you back a price quote immediately. If you need more information take a look at the new screen door questions and answers page.